Toast on a Stick Anyone? Remember the Carousel of Progress at Disneyworld? I loved that attraction because it reminds us of how far human ingenuity has taken us. It's fun watching how things have changed over time. Some products we take for granted today like computers and cell phones, were just dreams on a drawing board back in the Fifties. Other everyday conveniences, like televisions and small appliances were around, but bore little resemblance to what we use today. Human creativity has improved our lives enormously, but that fact is hard to appreciate unless you remember where we came from. Let's board the Carousel and take a little ride back in time. Let me illustrate. Making toast for breakfast is routine, right... just drop in your bread, select your darkness setting, and read the paper until it pops up, perfectly done. We thought our first toaster was a marvel. It had little doors that opened out, and you placed one slice of bread on either side. The bread was exposed to a heating element, but had no settings. It you didn't watch it, the signal that it was done was a kitchen full of smoke. I remember my grandmother, who lived with us, wanted no part of our new-fangled toaster. She made toast cave man style, using a long pronged fork to spear the bread and then holding it over the stove-top gas burner until it was done. I saw a great old Honeymooners episode recently where Ralph Kramden took all his calls upstairs at the Nortons because he and Alice didn't have a phone. Believe it or not, the telephone was considered a luxury for many working families in the Fifties. When we finally got ours, it was a big deal. There it sat, big, black and ugly, with a rotary dial. I think for a month we loitered around hoping it would ring so we could answer it. There was no touch tone dialing, call-waiting, call forwarding or voicemail, but then again there were no telemarketing calls at dinner time either. We had seven digit alpha-numeric phone numbers in the dark days before area codes, and every neighborhood had a special "exchange" designation such as Murray Hill (MU), Melrose (ME), and Butterfield (BU) as in the movie "Butterfield 8". Big advances have also been made in the last bastion of the suburban male, the barbecue pit. Modern grills look something like the Lunar Excursion Module, with multiple burners, storage shelves and instant-on ignition, all packaged in a shiny metal skin. The grills of the Fifties were much simpler, the barbecue equivalent of toasting bread on a stick. They were usually round, black affairs with a grill cover that you removed to pile on the charcoal briquettes. You then soaked the pile of charcoal with enough starter fluid to make a Molotov cocktail. After clearing out anyone in the immediate vicinity, you struck a wooden match and ran for the hills. The resulting whoosh and leaping flames left many a good man to finish cooking the burgers with no eyebrows. Computers have undoubtedly changed our lives forever, whether for better or worse depends on who you talk to. The computer is a great tool, but it wouldn't be any fun without the doorway to the world it has opened for us...the Internet. Al Gore (a legend in his own mind) has tried to take credit for inventing the Internet, but in truth it was a number of much smarter people. I remember writing papers in college and spending days in the local library rummaging through yellowing card catalogs and dusty book shelves trying to do research. Today we just Google a subject and up comes all the research you could ever want. From the comfort of our homes we can shop, book vacations, listen to music, play games and a lot of other things thanks to the Internet. I guess the down side is that we become obsessed and spend hours in the house with the mouse instead of outside in the sunshine. I wish I could be around long enough to see what the next 50 years will bring. Maybe someone will figure out that all this progress is really bad for us. We e-mail when a phone call is much more personal; we're getting fat because nobody walks anywhere any more, high school kids are committing suicide because of what cyber-bullies are saying about them on Facebook...when you think about it, progress has a price. I think I'll sign off and go for a walk. Then maybe toast some nice bread on a stick. "Winter is on my head, but eternal spring is in my heart." -- Victor Hugo. There is something about the coming of Spring that wakes up one's soul. It's like trudging over a cold road that feels like it will never end, and suddenly, over the next rise, the sun hits you full in the face and life is good again. I honestly believe that, just as Spring wakes up the flowers that sleep in the ground, it wakes something in ourselves as well. Spring has always been synonymous with hope, and it seems much easier to hope in April than it does in November. Remember when we were kids, and we caught that first whiff of warm breezes that promised wonderful things like picnics, the ice cream truck and trips to the beach. For me as a kid, Spring meant one thing above all else...baseball. We played football and roller hockey in the streets in the winter, but to me that was like just killing time until it got warm enough to suit up and take the field. I remember playing for our grammar school team under the watchful eye of coach John Bryan. We practiced mostly in Highland Park on Jamaica Avenue, where left field sloped severely upward, and anything hit deep to left was tough for a fielder to run down because he was running uphill. Luckily I played center field where the ground was more level. We played some of our games there too, or at the Parade Grounds in beautiful Prospect Park. That's me top left with all the hair. Sigh. Sometimes I'll be walking by a baseball field today and hear that unmistakable crack of the bat. The sound transports me back in time to hot, sunny days where you could literally smell Spring in the air. We'd stand around the enclosed chain link cage waiting our turn to take batting practice. While we waited it was customary to hurl brutal insults at whoever was unlucky enough to be at the plate. The hitter would glower at his tormentors, trying even harder to hit one over the fence to shut us up. This pressure to hit one hard usually led to strikeouts, prompting gales of laughter from the jeering chorus and much colorful swearing from the hapless batter. When fielding practice came along, the infielders were drilled in scooping up ground balls and making that long throw to first base. Outfielders practiced shagging fly balls hit by the coach, and firing the ball in to home plate to simulate throwing out that runner who had the nerve to challenge your arm. 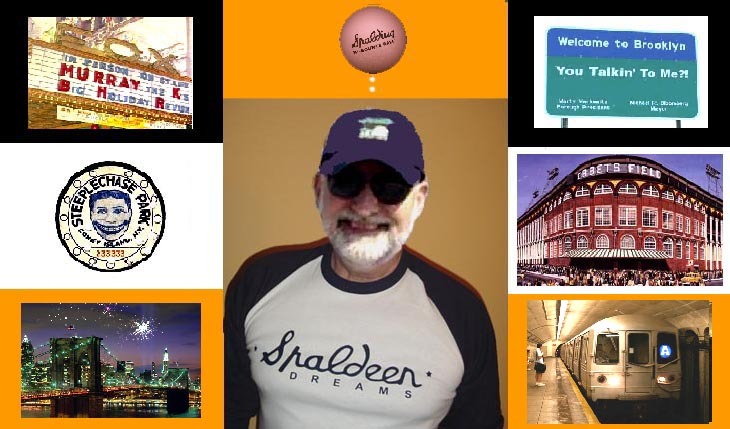 Although a lifelong Yankee fan, I modeled myself after the great Dodger right fielder, Carl Furillo. Carl was renowned in the National League for having a "gun" for a throwing arm, and not many runners put his reputation to the test. For my entire baseball career, I always wore number 6 on my uniform as a tribute to Furillo. When we weren't playing on a baseball field, it was stickball in the street. If you think it's easy having a ball game in the middle of a city street, try it sometime. There were mutually agreed upon rules about what happened if a car came down the block while play was in progress. It was the only way to manage, but we were resourceful city kids and we made it work. We'd saw off the handle from some poor family's broom to use for a bat until we found a broom factory that would sell us new broomsticks in bright red or blue for just ten cents. All we needed was a Spaldeen and the game was on. We used car fenders and manhole covers for bases, and after the game, no matter the outcome, it was ice cold sodas at the candy store for everybody. The great baseball player Rogers Hornsby said: "People ask me what I do in winter when there's no baseball. I'll tell you what I do. I stare out the window and wait for spring." That's a little how I felt growing up. I remember laying down in the outfield smelling the new grown grass mingled with the smell of my oiled leather glove. It was an amazing time when nothing ached and my energy was boundless. When I get that first whiff of Spring, I am standing in shallow center field with the sun hot on my neck, just daring someone to hit one over my head. Of course all of this is in my mind. My body is worn down now, and I sympathize with comedian Ray Romano who recently commented that he's so out of shape that he pulls a muscle doing a Rubik's Cube. The days when nearly all our relatives lived within walking distance are long gone. Growing up in Brooklyn, virtually three generations of our family lived in a one mile circle around the intersection of Rockaway Avenue and Fulton Street. 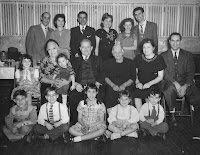 The only ones who did not were my father's brother Joe and his family (View Buddy and May) and the family members still living in Grassano in southern Italy, with whom, sadly, we maintained no contact. My son and I are trying to track down long lost relatives on Facebook, but it's a tenuous process at best. The Italian branch goes by the name of "Pantaleo" as it appeared on their immigration records. Somehow in passing through Ellis Island, the name got changed to "Pantaleno" which is how we are known today. When I tracked down those immigration records, it was a shock to say the least to find out that indeed we have been living under a different name than our ancestors. That one-mile circle in Brooklyn was pretty much our world. We saw our extended family frequently at holidays, birthday parties, weddings, christenings and funerals. We thought nothing of living in close proximity to each other; that's how everybody in the neighborhood lived. In between events we just dropped over for coffee and cake, a dying custom by the way now that everybody shudders at the mere mention of cake. We played outside with our cousins, literally growing up together. Clothes and toys were passed around until they wore out. If anybody was going through a tough patch, the family was there for support. People looked out for each other, and not just family members. The "mothers' miracle network" knew pretty much everything, and if you did something wrong, the news reached your Mom even before you got home. And then all that began to change as Brooklyn changed. We were used to having people in the neighborhood who looked like us...white. As Blacks and Hispanics moved in, whites panicked and fled to the suburbs. My Aunt Mary moved to Selden, Long Island, a wilderness in the late fifties. My Aunt Anna moved to the edges of Brooklyn bordering Queens. Even my parents moved to Ozone Park, but not before our home in Brooklyn had lost nearly all its value. My Dad had maybe the worst instincts for real estate decisions ever; his motto might as well have been: "Buy High, Sell Low." The conveniences we were so used to having, like stores, schools, churches and great public transportation within walking distance were gone. Funny, I recently heard through a mutual acquaintance from a Trappist Monk named Father Augustine who was born on the same block as me, but is now stationed in Tennessee. He says one of the things he misses most is good Italian bread, apparently unknown in Tennessee. Through the 1960s, our family continued to spread out, moving to far-flung places like Arizona, North Carolina, Florida, Maryland, and New Jersey. We had a fairly large contingent in Long Island. Things were just not the same. We saw each other pretty much only at weddings and wakes. Cousins and their children grew up without ever seeing much of their extended family. We had a family reunion a few years back and it was a wonderful sight to see first and second cousins getting to know each other as if they were strangers, which in essence they were. I know things can never be the same for them, but I remember how it was for me growing up in Brooklyn surrounded by family, and I can't help being a little sad for my children and grandchildren that they will never know that feeling. I had a Facebook contact recently from the daughter of one of my cousins who lives way out in Riverhead at the eastern tip of Long Island. Her Dad died tragically when she was still a baby, and her Mom and siblings all live out of state. She is very interested in stories and pictures from those long ago Brooklyn days, and I am happy to try to fill in any blanks I can. We'll be getting together for lunch to catch up, and happy as I will be to see her, I can't believe that she is now a grown woman, and we have had so little contact for so many years. I know, we have telephones and e-mail, and we can always jump on a plane to visit family once in a while, but its just not the same as regular sit-downs for coffee and cake at the kitchen table. We will soon celebrate the feast day of St. Patrick, patron saint of Ireland. Patrick was born in the later half of the 4th century AD. There are differing views about the exact year and place of his birth. According to one school of opinion, he was born about 390 A.D., while the other school says it is about 373 AD. Again, his birth place is said to be in either Scotland or Roman England. His real name was probably Maewyn Succat. Though Patricius was his Roman name, he came to be familiar to us as Patrick. Patrick was the son of Calpurnius, a Roman-British army officer, stationed in Britian. One day a band of pirates landed in south Wales and kidnapped this boy along with many others. Then they sold him into slavery in Ireland. Patrick escaped and made his way to France where he joined a monastery and studied under St. Germain, the bishop of Auxerre. When he became a bishop he dreamed that the Irish were calling him back to Ireland to tell them about God. So he set out for Ireland with the Pope's blessings. There he converted the Gaelic Irish, who were then mostly Pagans, to Christianity. There are many legends associated with St Patrick. It is said that he used the three-leafed shamrock to explain the concept of the Trinity; which refers to the combination of Father, Son, and the Holy Spirit. Legend also has it that Saint Patrick put the curse of God on venomous snakes in Ireland and drove them into the sea where they drowned. Patrick's mission in Ireland lasted for over 20 years. He died on March 17, AD 461. That day has been commemorated as St. Patrick's Day ever since. As a kid, I grew up in an ethnically mixed neighborhood, but in the church I attended, Our Lady of Lourdes, the dominant influence were the Irish. They had preceded the Italians in the great immigration waves of the late 1800's and early 1900's that deposited so many new inhabitants on our shores. Back then primarily Irish priests presided in Brooklyn parishes and ours was no exception. The laity of our church were mostly Irish too...God fearing people whose pious women starched and ironed priestly vestments and altar linens, and whose red-faced, white-haired men served as ushers and maintenance men. St. Patrick's day was a really big deal for them, and every year the parish hosted a party to celebrate the event in the church basement. The affair was about what you'd expect. Corned beef and cabbage of course washed down by endless pitchers of beer. I don't believe they served hard liquor but I'm sure many a flask of rye found its way into that low-ceilinged ballroom. The main entertainment at the party was the Lourdes boys' choir, of which I'm proud to say I was a member. We dressed in white shirts, and for this special night, traded our royal blue school ties for ones of bright green. On the makeshift stage, they had set up bleachers of a sort for us to stand on so that we were arranged in rows, with the sopranos up front and the older boys, whose voices were already changing and prone to cracking, hidden in the back rows. Our choirmaster, Brother Justinian, had rehearsed us well and led us now in song, his stern face topped by jet black hair combed straight back. We sang the Irish classics like: My Wild Irish Rose ▪ I’ll Take You Home Again, Kathleen ▪ McNamara’s Band ▪ When Irish Eyes Are Smiling ▪ Too-ra-loo-Ra -Loo-ral ▪ Did Your Mother come From Ireland, and our big closer that never failed to reduce all those Irish lads and lassies to tears, Oh Danny Boy. We always received huge ovations, part appreciation for our rousing singing and part relief that the glasses could now be refilled. We were allowed to stay and enjoy the party for a while, and I learned to my surprise that Brother Justinian had a whole other side to him. This gifted organist and pianist, once lubricated by a few beers, sat down at the piano and brought down the house with everything from pop to classics. Growing up in Brooklyn, the Irish and Italians didn't always see eye to eye, but I have come to respect them. They are a good people whose migration to America was spurred by hardship and poverty back in the Motherland. I learned more about how grim life in Ireland was from reading marvelous books like "Angela's Ashes" by Frank McCourt. To all my Irish friends, I celebrate you as a people and wish you a happy St. Patrick's Day. For a gift I offer you the old Irish blessing: "May the road rise to meet you: May the wind be always at your back, The sun shine warm upon your face, The rain fall soft upon your fields, And until we meet again May God hold you in the hollow of his hand."